剛剛解開的只是中文化的檔案,接下來要透過 Web 的設定方式修改成中文版.首先在Administer 選擇 Site building 的 Modules 來設定我們的中文. 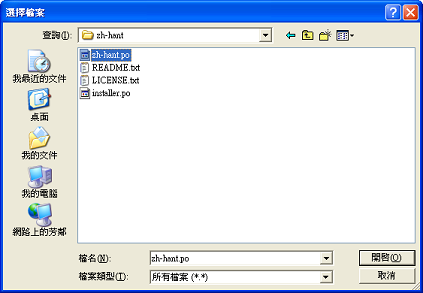 你可以看到一個 Locale 5.2 Enables the translation of the user interface to languages other than English.這個模組的主要功能就是管理多國語系的,把他 Enabled 吧(在方框框中打勾). 不要忘記了將剛剛的設定儲存下來.回到剛剛的Administer 在Site configuration 你會看到一個設定是關於地區的 Localization.位我們的中文化做設定. 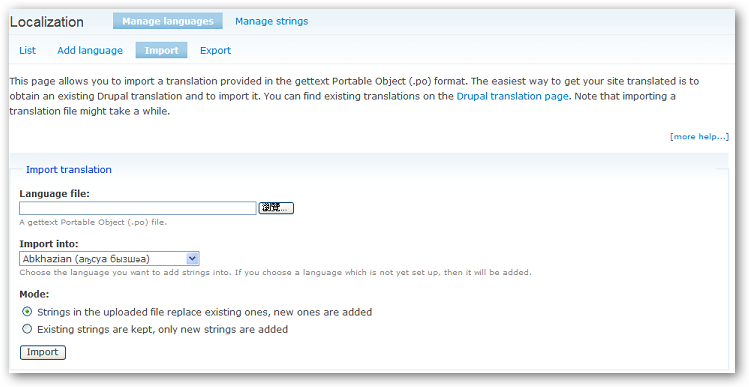 我們需要將剛剛下載的中文檔案 import 到我們的 drupal. Import 之後你會看到下面 zh-hant 這個設定,不過預設還是剛剛的英文版,我們必須將 default 設定成 zh-hant 這樣我們才會看到中文的介面. 還是不要忘了 Save configuration 這一個步驟.Save 之後你可以看到所有的設定都變成了中文,現在感覺親切多了吧! !當我們將英文版改成中文有些版本會發生 管理/模組頁面 變成空白.這是因為 PHP 的記憶體模組用光系統預設的記憶體,這時候我們可以透過修改 /etc/php.ini 來解決這個問題. 設定 PHP 記憶體大小的地方有 3 處,所影響的範圍各不同,首先是 /etc/php.ini 會影響到系統上所有使用 PHP 的 websites 以及 PHP scripts . 而 /var/www/html/.htaccess 只會影響到 Drupal root 目錄下的 websites . 如果你的 Drupal root 目錄下有多個 websites 可以透過 /var/www/html/sites/default/settings.php 來設定個別 website 的 PHP 記憶體大小. 通常使用的模組越多所需的 php 記憶體需求越大,目前 benjr.tw 已經將 memory_limit 調整至 32M 的大小.